USS Gearing (DD-710) was the lead ship of her class of destroyers in the United States Navy. She was named for three generations of the Gearing family, Commander Henry Chalfant Gearing, Sr., Captain Henry Chalfant Gearing, Jr. and Lieutenant Henry Chalfant Gearing, III. Gearing was launched on 18 February 1945 by the Federal Shipbuilding & Drydock Co., Kearny, New Jersey. The Gearing was sponsored by Mrs. Thomas M. Foley, daughter of Commander Gearing and commissioned 3 May 1945 with Commander T. H. Copeman in command. Only fiveGearing class destroyers saw action during the last campaign of WWII. 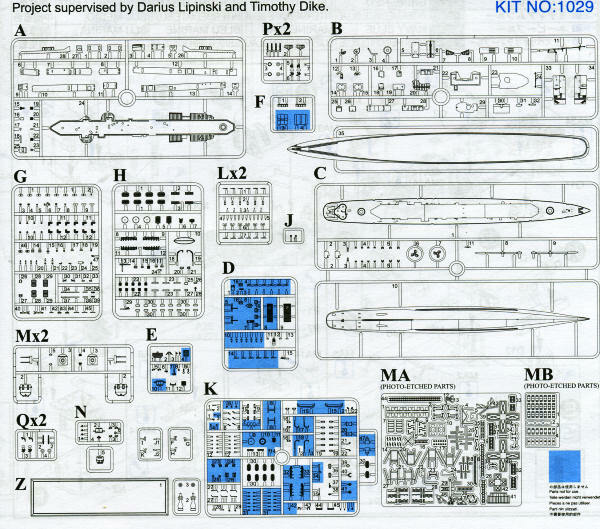 Ship modelers go agog whenever a new kit is on the horizon and so it was when the Gearing class was announced. Here was the first post-war class of destroyer built and built in rather large numbers as well. Following on the success of the Buchannan and other destroyer kits, it is no surprise that Dragon provides everything the modeler needs (except railing) to build a quality ship model. This includes a pair of photo etch frets for a myriad of enhancements such as turret ladders, AA-gun sights, life rafts, stack screens and the list goes on. 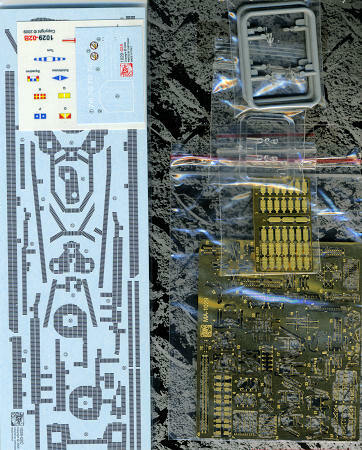 This is a somewhat complex kit with over 430 parts. It also includes six crew figures so that you can add some life to the decks. The instructions are very well done with easy to read construction steps. You spend the first part of the build making up a large number of smaller subassemblies like guns, searchlights and directors. Getting the main deck built means adding on much of the photo etch in terms of hatches and things on the bulkheads. The kit can be built as a waterline if you so desire, but there is no separate bottom plate as you find on some other kits. The lower hull is well done and appears to fit quite well. A stand is provided with some small posts that support the model (assuming you have remembered to drill out the holes in the lower hull). The decal sheets are very well done. I appreciate that Dragon has given us non-skid decals to place on the weatherdecks. These are a common sight on any US Navy ship. A sheet of flags is also provided as well as the one with the ship's name and number. 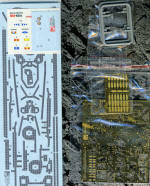 Another truly superb ship kit from our friends at Dragon. As a reminder, this is how she appeared when launched. I'm sure that a FRAM I variant will be done on another of this class some time in the future. My thanks to www.dragonmodelsusa.com for the preview kit. Get yours today at your favorite store or on-line retailer.